This is a great recipe. I love candy apples and recipes that suggest using cinnamon hard candies instead of just Karo syrup and food coloring are the best. 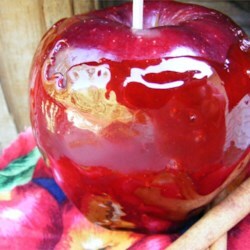 It ain't a real candy apple unless it has the cinnamon candy coating. The only things I would warn are that (1) This recipe will not allow you to make 12 apples. I bought very very small red delicious apples and was only able to make 5. So in order to make 10-12 consider doubling the recipe; (2) I added an additional TBSP of water than what was called for in the recip in order to stop the candies from burning so make sure to watch out for that (3) I used cinnamon disks not red hots, I think the cinnamon disks give them a nice shine. You can find cinnamon in any grocery (Brach's candy to make - think of peppermints but all red and flavored like cinnamon). Otherwise, this recipe is MARVELOUS and ridiculously easy though, if you have never made them before, I would recommend having the candy themometer on hand and just trying to gauge by the water test. Also, the wax paper worked fine for me, you just have to make sure they have cooled completely before trying to remove them from the wax paper.